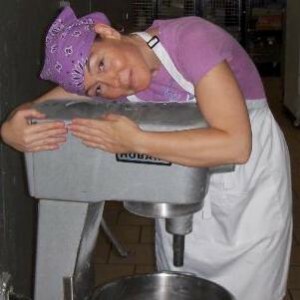 Meet LORI BYARS, “owner and mad baker” of the CHESHIRE CAT CONFECTIONARY and Featured Business Owner at SCORE Chicago this week. Learn how she started, and what tips she has for your success. Cheshire Cat Confectionary is a new bakery in Chicagoland and online featuring Adventurous and Wonderful Custom Desserts. We have a gallery of gift boxes including Binge on Broadway, Gnaw on Gnomes, and Ravage the Rainbow (shown here). I have been a Broadway stage manager with a baking hobby for the last 20 years. Recently I found that being in the kitchen, covered in flour, was more exciting than any theatrical magic I had experienced. 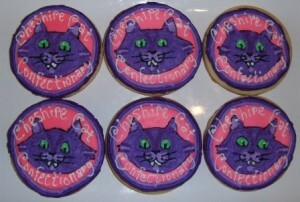 Cheshire Cat Confectionary is the perfect vehicle that combines my management experience with my creative mania. I get to be my own boss and create Adventurous and Wonderful Custom Desserts. At Cheshire Cat Confectionary, customization and convenience are key selling points for everyone from busy professionals to multitasking moms. 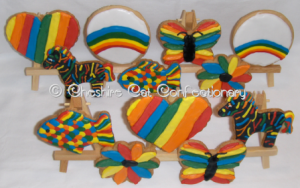 Whatever their workload, with just a few clicks, they can have a fresh made, hand crafted order delivered directly to their door. We had a great holiday, selling over 1,000 cookies! 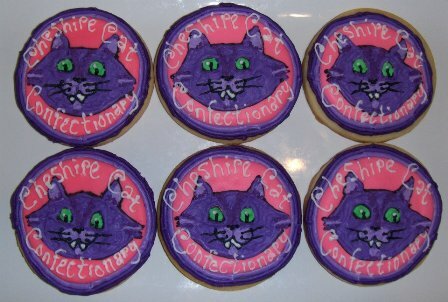 Cheshire Cat Confectionary uses primarily the internet and social media not only to sell products but to advertise, market, and promote them. For example, see many fun cookie designs on our Pinterest boards. Through these mostly cost free outlets, constant connections are made to current and future customers and in turn, these customers share the information with their family and friends. Be as prepared as you can and be flexible. Come up with a brilliant, highly detailed plan and then be prepared to throw it out the window and try something else at a moment’s notice. What is Your SCORE Mentor’s name and how they have helped you in your business? Mitchell Morris is my SCORE Advisor. He laughed at me when I walked in to our first meeting and announced that I would open my business in 3 months. When he saw that I was serious, he rolled up his sleeves and jumped right in with me. He provided much needed guidance for structuring and composing my business plan. He also was an excellent resource for finding financial assistance providers. Please visit www.CheshireCatConfectionary.com for Adventurous and Wonderful Custom Desserts. What can we create for you?